Today, a case is not only just a case. It has to be balance with structure and looking to fulfill the needs of users. 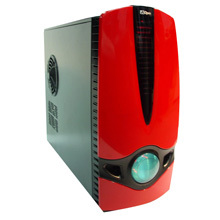 G520 housing is the brand new design and manufactured by AOpen Inc. that will catch your eyes. For the first time you see G520, you will notice the multi-color LED illuminated front panel. The LED This fancy feature will declare the high performance within. As a tower housing, G520 is for Micro ATX or Flex ATX motherboards; and the dimension is 410(H) x 190(W) x 450(D) mm. For safe Assembly, the whole design is chassis bend-in edge. To ensure the expend ability, there are standard four 5.25", two 3.5” so at least 4 standard 3.5" HDD can be added to G520. 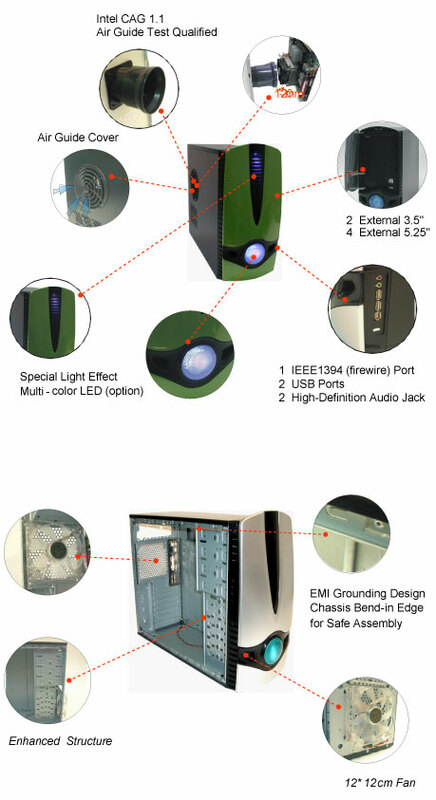 It also ship with an ATX power supply unit with 12cm fan that not only provides power but also cooling whole housing. At rear, there are four expansion slots and one vent for 12cm fan for add on cards and better thermal. There are more and more portable devices present in your bag and they have to connect to PC for data transferring. To ensure the best convenience usage experience, there are one IEEE1394 (FireWire), two USB ports and one high-definition audio jack at the G520 front panel. There is also a 12cm fan hidden just behind the front panel to intake cool air for better thermal. G520 is design to meet high standard of thermal. It’s Air Guide Test qualified and comply Intel CAG 1.1 to ensure great thermal. Therefore, AOpen G520 is a housing that not only looks great but rich of features. You should put it on top of your purchase list of housing.